After a week of repeated apologies to the victims of the Windrush scandal and assurances by Prime Minister Theresa May and Home Secretary Amber Rudd that they would not be facing any more deportations, we have discovered evidence of a special chartered removal flight to Jamaica next week. We spoke to a very relieved Yvonne on her way home with her daughter and granddaughter last night. Kareca Jones, her 40-year-old daughter, said that being detained indefinitely had taken a great toll on her previously healthy mother’s mental and physical health. “She now has diabetes and had to go hospital with an enlarged heart,” said Kareca, “before she was detained she never had health problems. Kareca accused health staff at Yarl’s Wood Removal Centre of ignoring her mother’s repeated please about her deteriorating health. She also spoke of the stress and cost for all the family of having her 59 year old mother taken away. The grandmother was the main carer for her young grandchildren, who along with her siblings, mother and children, all have British citizenship. Yvonne Williams with the elderly mother she has been unable to visit while detained. Another grandmother incarcerated at Yarl’s Wood detention centre has not been as fortunate. Yvonne Smith, 63, remembers waving to the Queen when she visited Jamaica. She was born a citizen of the UK and Colonies eight years before Jamaican independence. Yvonne’s father and mother came to the UK in the 1950’s. Yvonne stayed behind with her grandmother joining her British siblings and father in Birmingham after her mother and grandmother passed away. 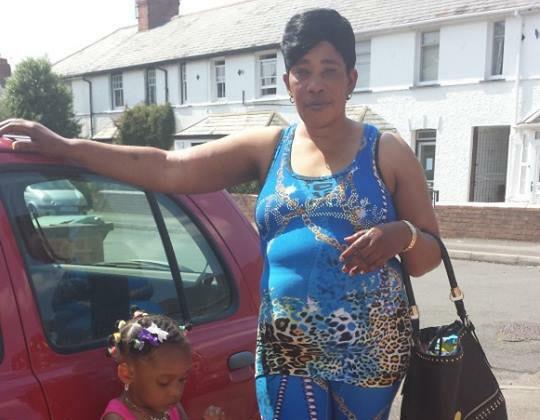 Her brother, sisters, nephews, nieces, children, grandchildren are all British and she has no family left in Jamaica. Around 40 people were removed to Jamaica on a specially chartered flight with the same number in March last year, some in shackles. Passengers on the secretive flights can be handcuffed or fitted with leg and waist restraints. Brilliant expose but an error’s crept in: ‘Yvonne Smith, 63, remembers waving to Queen Victoria when she visited Jamaica.’ Pretty certain it’s Queen Elizabeth! 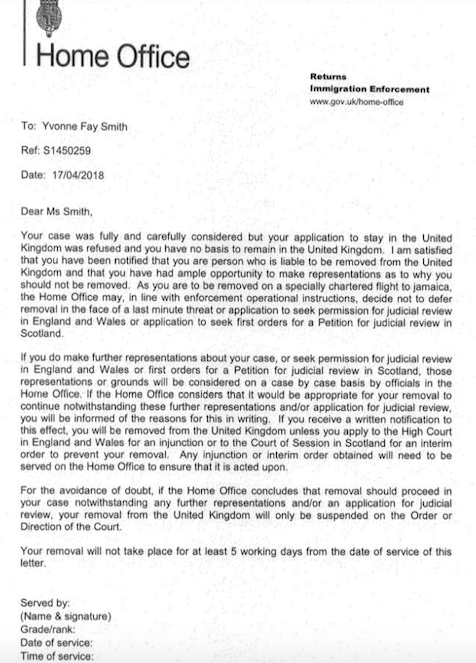 Quite a few grammatical errors in the Home Office letter. Jamaica without a capital J for one, incompetent as well as cruel. Personally I don’t give a fig about grammar but isn’t this the sort of thing that these little Englanders complain about? Well that’s typical. The government never sticks to its word. It isn’t just migrants that have it bad in this country. The British population aren’t treated right either. What it coming to!